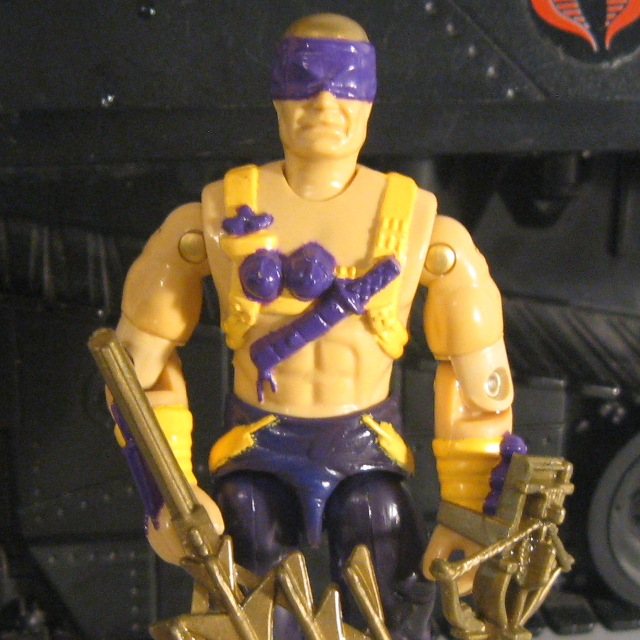 Notes: DiC's Night Creeper Leader wore the 1990 version of Night Creeper's outfit, with his head covered by a loose purple cloth that left his face visible except for a large white visor. 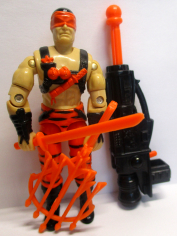 Accessories: black spring missile launcher with orange trigger (93 H.E.A.T. Viper's), orange spring missile (93 H.E.A.T. Viper's), orange knife (88 Hydro-Viper's), two orange swords (91 Snake Eyes's), orange crossbow (88 Road Pig's), orange crossbow (90 Night-Creeper's), orange arm shield (88 Road Pig's), orange figure stand (common). Captured Cobra documents revealed the existence of a contract between COBRA COMMANDER and a syndicate of high-tech ninjas led by the NIGHT CREEPER LEADER. He is believed to conduct all field intelligence and covert operations for Cobra. All investigations into his origin and the structure of his NIGHT CREEPERS have run into dead ends. Sources suspect he molds them with the scruples of a Wall Street stock manipulator, the lethal skills of a master martial artist, and the stealthy talents of a cat burglar; then arms them with a sophisticated anti-detection and weapons technology. Motto: "If Atilla the Hun had a blackbelt, an MBA, and was armed with lasers he'd resemble me, except not as mean!" Accessories: gold spring missile launcher with black trigger (93 H.E.A.T. Viper's), gold spring missile (93 H.E.A.T. Viper's), gold knife (88 Hydro-Viper's), two gold swords (91 Snake Eyes's), gold crossbow (88 Road Pig's), gold crossbow (90 Night-Creeper's), gold arm shield (88 Road Pig's), gold figure stand (common).